100% complete & nutritionally balanced. With a prebiotic to help support healthy digestion. Antioxidants to help support healthy immune system. With added protein to help support muscle strength. Vitamin D & minerals for healthy teeth & strong bones. With fibre from whole grains to help support healthy digestion. Vitamin A & zinc to help support healthy skin & coat. No added artificial colours, flavours & preservatives. 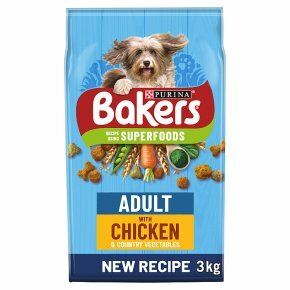 BAKERS(R) ADULT has a new, improved recipe that is now rich in chicken, with more variety of wholesome wholegrains & country vegetables for quality, tasty goodness. And don't worry, our recipe is still made with the same amazing taste that our BAKERS dogs know & love to gobble up! This recipe has been created with the perfect nutritional balance for your adult dog & contains the every day nutrients he needs to get on with all the playful & cheeky things that happy & healthy BAKERS® dogs love to get up to! BAKERS new improved recipe, so that your dog can enjoy the perfect balance of taste & goodness in every bowl, every day! Daily Feeding Guidelines in grams per day Size of Dog: Toy Dog, Dog body weight (kg): 1 - 5, Daily Feed (g/day): 35 - 105g Size of Dog: Small Dog, Dog body weight (kg): 5 - 10, Daily Feed (g/day): 105 - 170g Size of Dog: Medium, Dog body weight (kg): 10 - 25, Daily Feed (g/day): 170 - 315g Size of Dog: Large, Dog body weight (kg): 25 - 45, Daily Feed (g/day): 315 - 465g Size of Dog: Giant, Dog body weight (kg): 45 - 70, Daily Feed (g/day): 465 - 620g 1 = 100g One half pint mug holds approx. 100g of Bakers® Adult. To help keep your dog in an optimal body condition, adjust according to your dog's activity level, physical condition and individual needs. Clean, fresh drinking water should always be available.